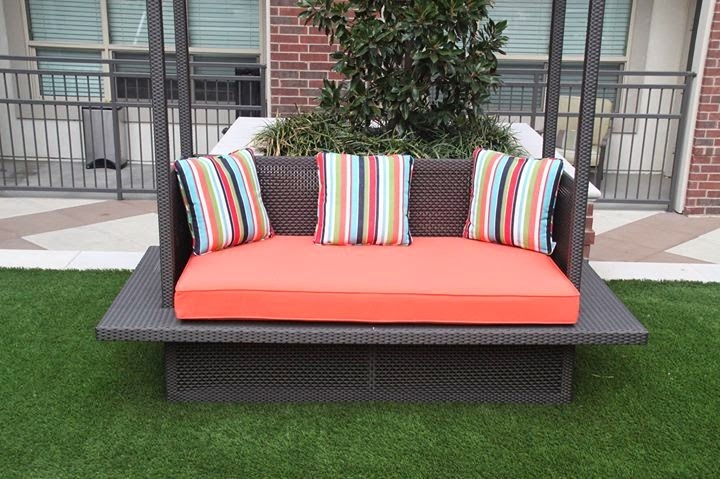 We Have Custom Patio Furniture Cushions Just For You! If you've been to our site lately, you know that we have Homecrest cushions on sale (10% off, along with our slings!). 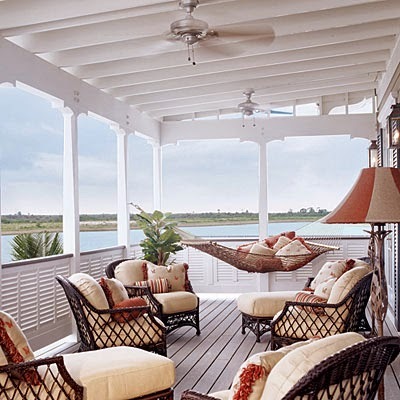 But if you thought we only offered custom cushions to fit Homecrest outdoor furniture, you should keep reading--we happen to have quite a few different designs and styles of outdoor cushions that will fit just about any better-quality patio furniture! While we do have quite the variety, Homecrest actually happens to be one of our favorites. We have the perfect solid blue fabric, as well as some snazzy stripes of our own for pillows. 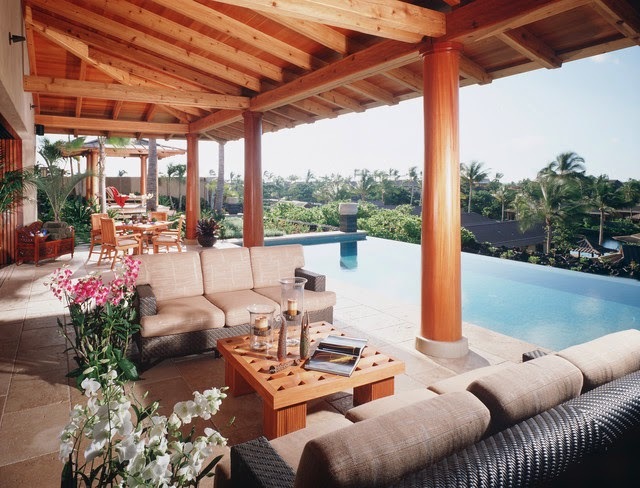 Imagine your patio furniture looking like this! 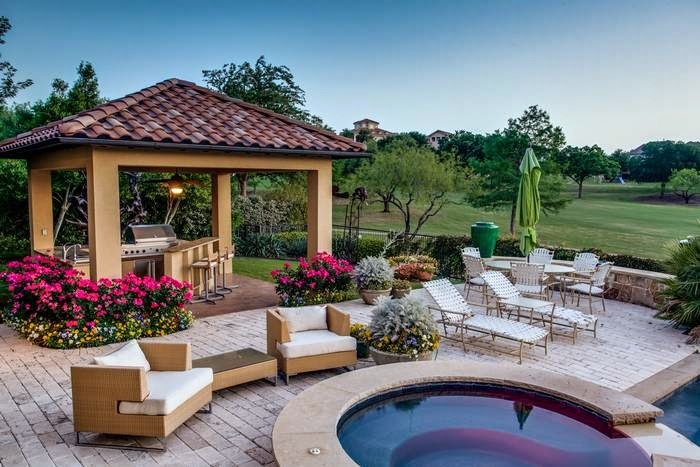 We also customize cushions in the "Deep Seating" variety, and offer a few "universal" styles, as well as some outdoor patio cushions based on some popular upscale patio furniture designs, such as the ones in our Malibu and Hill Country collections. 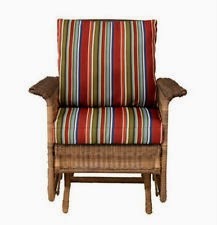 Deep-seating patio furniture cushions have become very popular over the last few years. 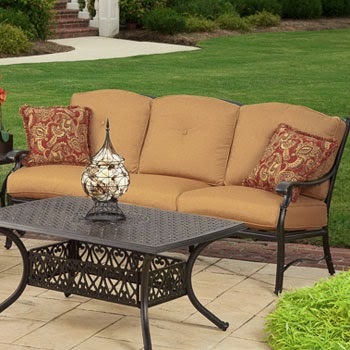 Typically this style of outdoor furniture uses a two piece cushion set with a separate back and bottom, but some of our universal cushions also come in one-piece styles. They fit as well as your original patio furniture cushions did--they're oversized and so completely comfortable, you won't want to get out of them! And they're pretty spiffy-looking, too! 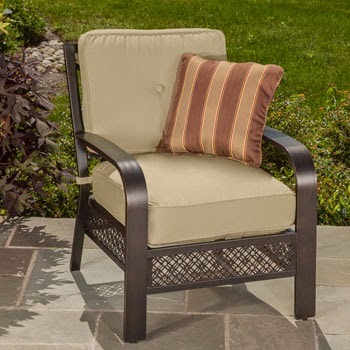 Another popular favorite with Chair Care Patio customers is our Agio replacement cushion collection. These get a little more specific--in other words, they're not "universal" cushions, they only fit certain makes and models of Agio outdoor furniture. Recently we added the Agio Reserve Ashmost, Rochester and Panama Collections to our offerings, along with the Amalfi, Balmoral, Manhattan, Vista and many others! We love making these, and so proud of the end results! This is by no means everything we offer in the way of cushions--we just wanted to share some of our favorites. 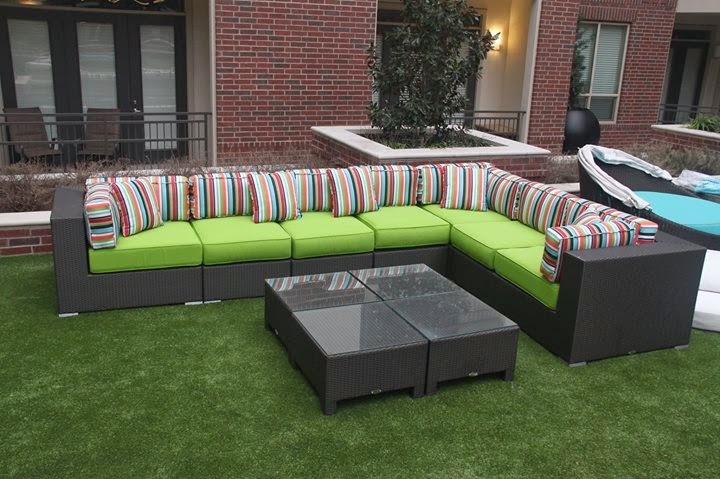 All of our patio furniture replacement cushions are made in our shops in Dallas, Texas. We do the work, we're not a middle-man reselling outdoor patio cushions made somewhere else. And that helps us keep prices more affordable while giving you the best quality. 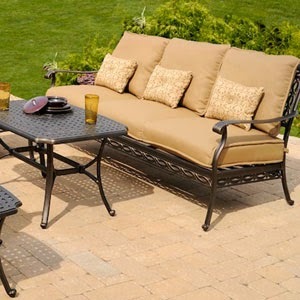 We can make a replacement outdoor cushion for just about any style of outdoor patio furniture you may have--just check on our site, in our FAQ or in the actual product section. We can even give you some tips on how to measure correctly for replacement cushions. And don't forget to send us those before/after pics, too--we may even feature them here, or on our Facebook or Pinterest pages. 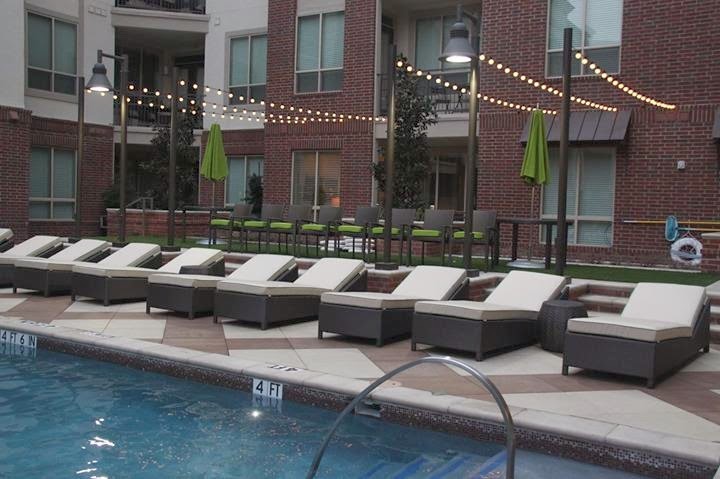 This first picture is of a patio which is part of a 7,000 sq.ft. 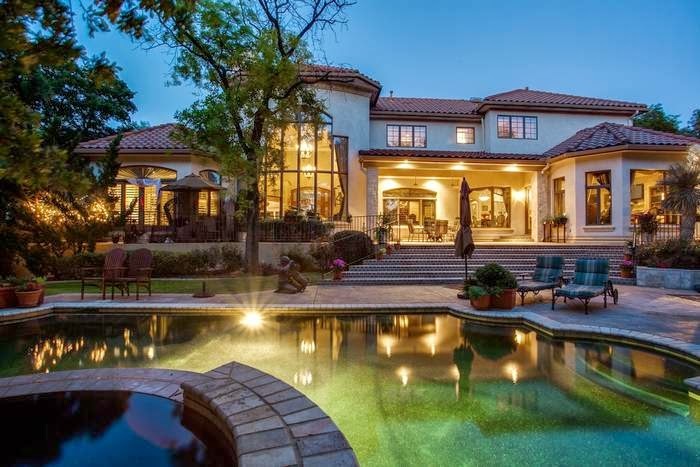 Mediterranean-styled home--the pool area is obscured here, but you can see the covered seating with an outdoor kitchen and a fireplace. Sweet! The cushions here are deep, too. Not one, but TWO covered areas! 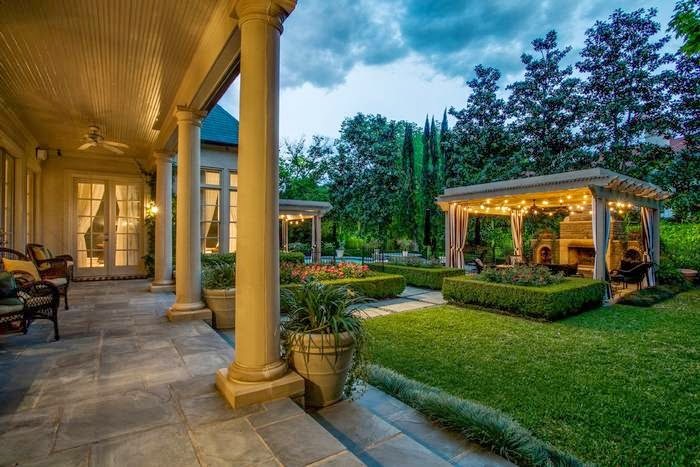 This is the backyard view of a French-inspired villa. 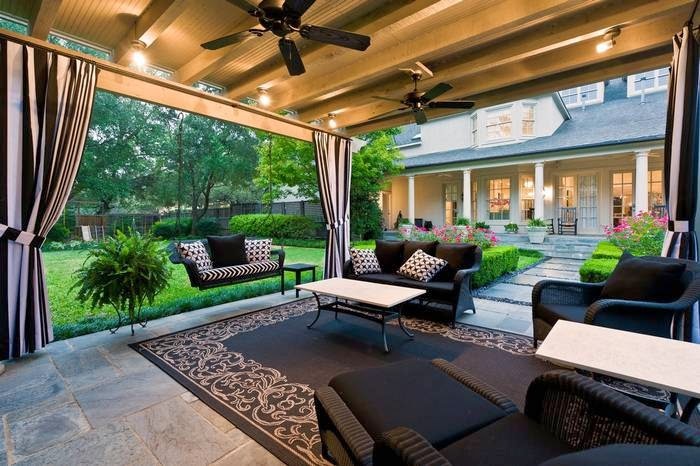 Note the lushness of the surroundings, and the outdoor drapes surrounding the pergola. Imagine decorating this! This is a closer view of the pergola from above. We love the black and white motif, we've got the stripes for this already! Finally, this lovely little corner of the city has an outdoor area with a kitchen, complete with a grill--and a saltwater pool! This is pretty wide-open, so you know that umbrella will come in handy. Ready to tackle your own patios yet? We are--we sure hope this little mini-tour was inspiring. Happy decorating! 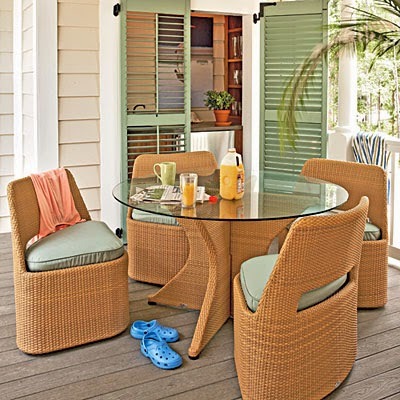 Quality Cast-Aluminum Patio Furniture--More Versatile Than Ever! 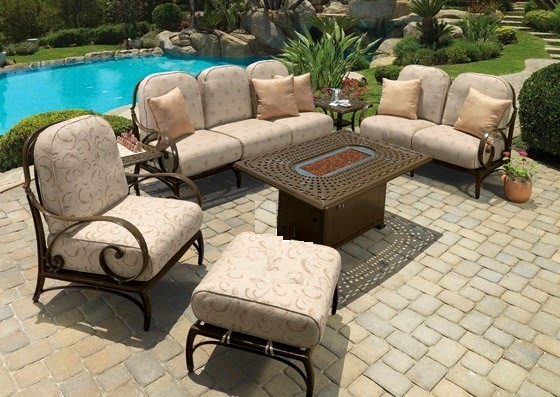 If you're gearing up to purchase some new patio furniture this year, or need to update a piece here or there, why not go with the newer cast aluminum models? Particularly if you're limited on how much to purchase and still get a quality product, this type of furniture might be your best bet. It's much more mobile than cast-iron, because it's lighter in weight. And it really looks classy, too! 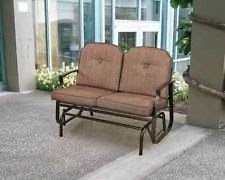 Good quality patio furniture needs TLC and sometimes, lots of it. It's an investment, and you get out of it what you put into it. And that can get costly, depending on the material used. If you've got pricey woods, they often must be sanded and re-stained with sealant every couple of years or so. If you've painted your wicker in the past, you know it has to be re-done every few years. Aluminum, on the other hand, needs far less maintenance than a lot of other patio furniture types. Typically, you only need to apply some soap, water, and "elbow grease" maybe once or twice a year to the frames, and it will look like new! Let's face it--the less maintenance time you have to spend, the more time you have for fun in the sun! 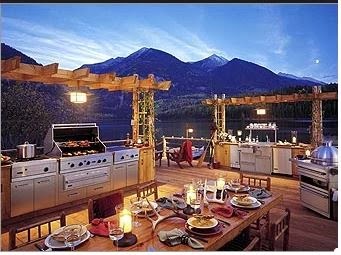 Best reason of all, for any patio furniture--Well-made quality aluminum furniture can withstand the elements. 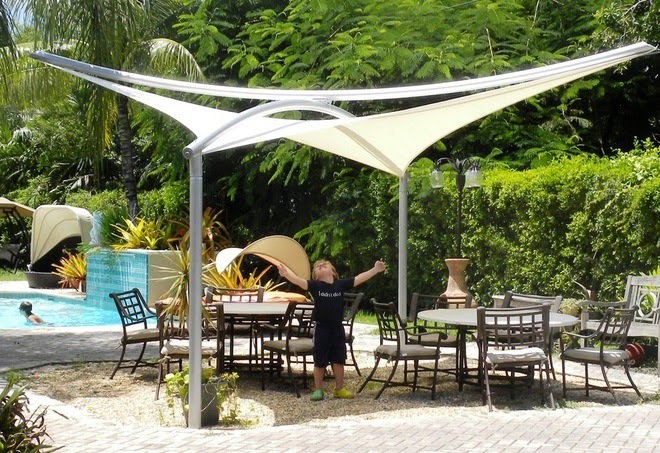 Many are "powder-coated", which gives them a tough, resistant finish and makes them perfect for outdoors. This metal won't chip, splinter, crack, melt or get all saggy and limp, either--so if you've got rough-and-tumble kids or pets, this may be the answer for you. Better yet, if you already have some cast-aluminum patio furniture that is in dire need of new coating, Chair Care Patio also offers powder-coating services for better-quality patio furniture! 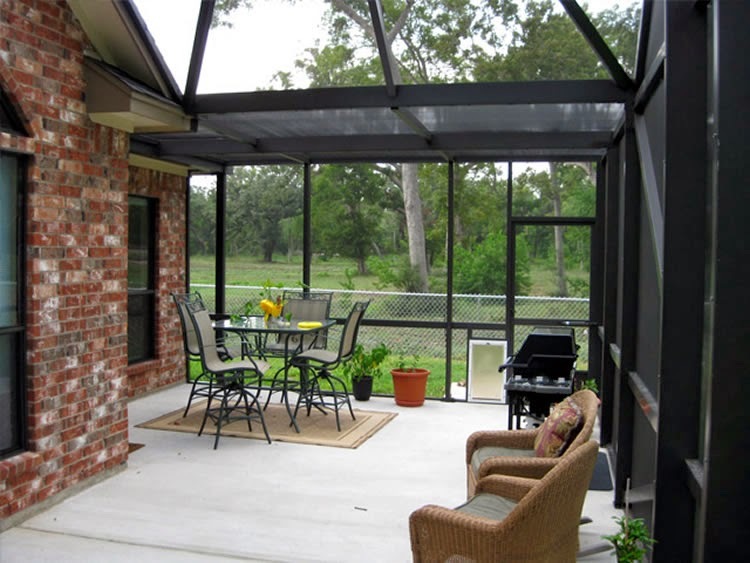 The sky is the limit these days, with styles and designs of aluminum patio furniture--there is surely one to fit your taste and budget, particularly with our fabric selections. If you're refurbishing some older cast-aluminum, why not consider new cushions and pillows? We can make something that we're sure you will find to be absolutely smashing. If you're really in the mood to splurge, you could even get a couple different sets of cushions and change out the decor during the season! Variety is the spice of life! Speaking of variety, next up, we'll show you the results of a recent customer with a keen eye for color and a need for a lot of cushions. Stay tuned!